Geocaching is an outdoor recreational activity that involves using GPS devices to locate hidden containers. Some caches even require the geocacher to solve puzzles. Geocaching is a game that can be enjoyed by people of all ages, families, clubs or groups. The first geocache was hidden in 2000, in the state of Oregon. The game became increasingly popular after the improved accuracy of GPS technology. Now there are millions of geocaches hidden all over the world! Learn about the settlement, important events, and well-known residents that lived in the oldest Virginia city west of the Blue Ridge Mountains. Winchester, Virginia changed hands between the Union and Confederacy over 70 times. Residents experienced constant uncertainty and turmoil, but life went on even as the cannon blasts of war thundered around them. 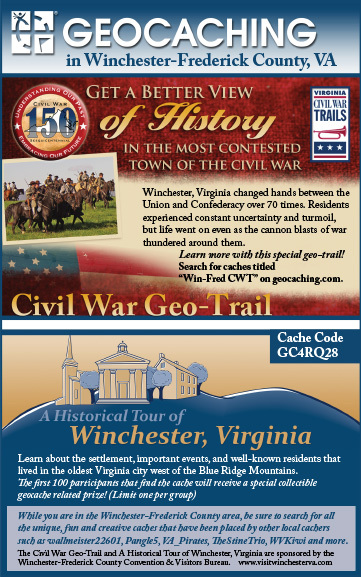 Learn more with this special geo-trail, which includes 20 important historical sites. Visit www.geocaching.com to learn more about geocaching. While you are in the Winchester-Frederick County area, be sure to search for all the unique, fun and creative caches that have been placed by other local cachers such as wallmeister22601, Pangle5, VA_Pirates, TheStineTrio, WVKiwi and more.